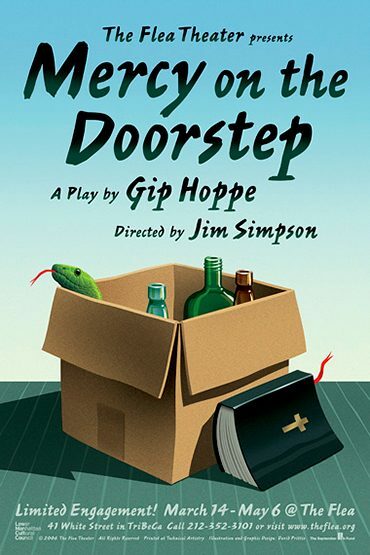 The Flea Theater presents the New York Premiere of MERCY ON THE DOORSTEP by Gip Hoppe. Coming off a successful run at the Wellfleet Harbor Actors Theater in Cape Cod, this dark comedy earned raves from the Boston Globe and the Cape Cod Times. Flea Artistic Director Jim Simpson directs. Produced on an Off-Broadway contract, previews begin March 14 with opening night scheduled for March 23. MERCY ON THE DOORSTEP tells the story of Corrine and Rena, an alcoholic widow and her born-again, right-wing stepdaughter. This mismatched pair must learn to co-exist in the house that Corrine’s husband left behind. It is a story about hope, redemption, and the ability for even the most disparate of philosophies to find a common ground. The play stars Laura Esterman (Obie, Drama Desk and Outer Critics Circle Award winner for Marvin’s Room), Jenn Harris (Lucille Lortel and Theatre World award winner for Modern Orthodox), and Mark Rosenthal (Marvin’s Room, After Ashley, Moonlight Room). Both Esterman and Rosenthal were in the original Wellfleet Harbor production. Set design is by Susan Zeeman Rogers, with costumes by Nathalie Ferrier, lighting by Kevin Hardy and sound by Rick Arnoldi. Gip Hoppe is the author of fifteen plays including Jackie: An American Life, Cuckooland, Savior of the Universe and Ruby Tuesday. His plays have been performed on and off Broadway, London’s West End, The State Theater of Germany and regional theaters across the U.S. His play A New War won the prestigious Elliot Norton Award in Boston and was produced at The Long Wharf Theater in New Haven. Gip is a founding member of Wellfleet Harbor Actors Theater (W.H.A.T.) on Cape Cod. MERCY ON THE DOORSTEP runs March 14 – April 14; schedule varies. All tickets are $35 and may be purchased by calling 212-352-3101 or visiting www.TheaterMania.com.